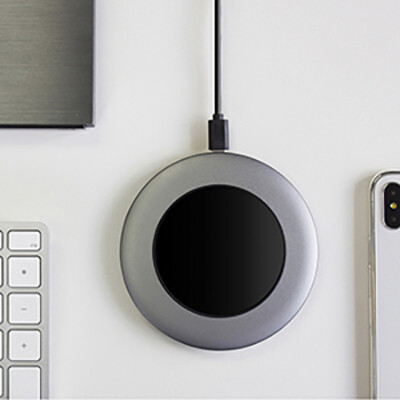 Features: Powerwave delivers wireless charging up to 10W for fast charging speeds and since is optimised for Apple and Samsung Fast Charge, you�ll always get the quickest wireless charge available! The rubberised ring holds your phone securely in place while charging and its fail-safe circuitry prevents over-charging and controls temperature to prevent overheating. Compatible with any smart phone meeting the Qi wireless charging standard (e.g. iPhone 8, iPhone X, Samsung S9). Includes micro USB charge cable and user manual. Material: Aluminium, Rubber.. Certification: CE, FCC, RoHS. Product Colour: Graphite. Product Size: 100 x 100 x 11 mm. Print Area: 55 mm (dia) (pad, 4CP), 28 x 8.3 mm (pad print, laser). Print Process: Pad Print, Laser Engrave, 4CP Direct Digital. Delivery: 3-4 weeks (indent) from art approval. Standard Packaging: Black Craft Paper Sleeve. Packing Details: 50 pcs per carton, 6.0 Kgs, 52x18x14 cms. Setups: Included.